Native Americans have experienced discrimination at the hands of European settlers during the colonial era and the white majority in the United States for over four hundred years. In that time, there have been a wide variety of policies towards Native Americans, some with good intentions and some bad, but none seemed to resolve the clash of cultures and the difficulties faced by Native Americans. They have rarely enjoyed liberty and equality in the American system of self-government. The first encounters of European colonists and Native Americans in North America set the patterns for the relationship for nearly two centuries. First, and most devastatingly, Europeans unwittingly brought many diseases for which Natives had no immunity, and hundreds of thousands died. Second, Native Americans sometimes benefitted from trading furs and other goods to Europeans, but the trade often altered traditional commercial routes or Native ways of life. Third, colonists and Natives engaged in a series of massacres and wars throughout the Eastern Seaboard that resulted in brutality and a large number of deaths on each side. Native American scalping of enemy combatants and civilians in the wars caused the Europeans to think them uncivilized savages. King Philip’s War, fought in New England in 1675-1676, remains the bloodiest war in American history in casualty rates. The British and Americans supposedly used germ warfare against Native Americans, but there was in fact only one unproven example of the British army spreading smallpox through blankets. Finally, the European population grew rapidly, and colonists expanded onto Native lands through war, broken treaties discuss these, and land grabs. Before, during, and after the American Revolution, there were a number of wars fought on the Ohio Valley and Mid-West. Native Americans on the frontier had generally sided with the French during the French and Indian War and on the side of the British during the American Revolution. Native Americans found that they lost large amounts of land after the American Revolution and did not have a say in the peace treaty. Some of the Founding Fathers expressed the hope that Natives would be integrated into American society by adopting private property and agriculture, white styles of dress, and education and written languages. They believed that this was a benevolent, humane, and enlightened policy, and that, if accomplished, the two peoples could live in relative peace. Nevertheless, after the American Revolution, white Americans continued to flood the frontier for agricultural land. This was spurred on by the Louisiana Purchase from France in 1803. Americans believed that they had a “Manifest Destiny” or divine mission to expand westward and conquer the entire continent. Native Americans would either be paid for their land or compelled to give it up by force. Either way, keeping all of their lands did not seem to be an option for white settlers. Native Americans on the frontier had generally sided with the French during the French and Indian War and on the side of the British during the American Revolution. Native Americans found that they lost large amounts of land after the American Revolution and did not have a say in the peace treaty. Manifest Destiny found support in federal law when Congress passed the Indian Removal Act (1830) that allowed the national government to relocate Natives beyond the Mississippi River. 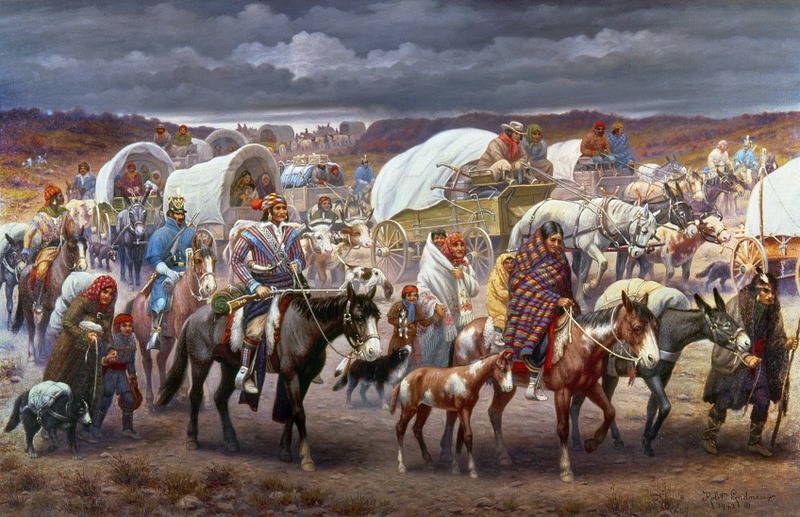 In 1838, despite the legal victory, more than 16,000 Cherokees were forcibly removed to the Oklahoma Territory and an estimated 4,000 died tragically in this “Trail of Tears.” It followed the removal of several other tribes from the Southeast including tens of thousands of Choctaw, Seminoles, Creek, and Chickasaw throughout the 1830s. In 1851, the Indian Appropriations Act initiated the policy of establishing reservations, or land parcels set aside for Native tribes, as an attempt to balance the demand of Western settlers for land and to protect lands for Natives. The land however was often poor, away from ancestral homes, and forced Natives to adopt white agriculture. Moreover, individual Americans demanded Native lands and chiseled away at the size of reservations. In addition, the reservations worsened the lot of Native Americans, but Americans continued in their advance to settle the continent. After the Civil War, the brutal wars between the Native Americans and federal troops continued with casualties on both sides. 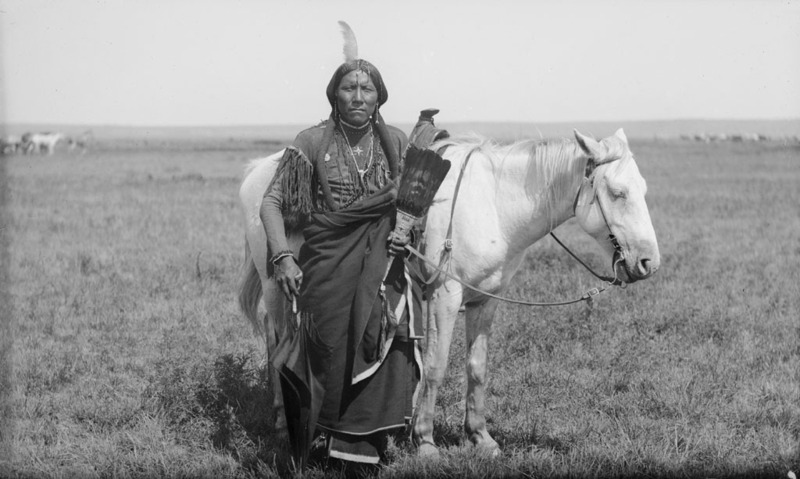 In 1876, General George Custer and the Seventh Cavalry attacked Chief of the Hunkpapa Lakota tribe, Sitting Bull, who led an alliance of Sioux and Cheyenne warriors at Little Bighorn. Custer recklessly attacked the Natives led by Crazy Horse, war leader of Oglala Lakota tribe, who killed Custer and all his 250 soldiers. In late 1890, at the Wounded Knee massacre, the U.S. Seventh Cavalry took revenge slaughtered 150 Sioux men, women, and children after the warriors refused to surrender their arms. During the mid-to-late nineteenth century, America industrialized as migrants continued to settle the West, using the Transcontinental Railroad and marking off private properties with barbed wire. Thus was it clear that the settlers were moving rapidly westward, establishing farms, and depleting massive herds of buffalo that the Natives depended upon for food. Reformers were outraged by the mistreatment of Native Americans as chronicled in Helen Hunt Jackson’s A Century of Dishonor (1881). Reformers sought to implement integration into American society with the Dawes Act (1887), which imposed a system of individual ownership of land and allotted parcels of land to Natives while selling off “surplus” land to white Americans. However, the Act both failed to protect Native lands or integrate them into American culture. In 1934, the New Deal reinforced the idea that the federal government would care for dependent Native Americans with the Indian Reorganization Act. The new law ended the policy of allotting land to individual Native Americans and supported tribal sovereignty over the lands. The federal government moreover provided funds for health care, social welfare, and education on the reservations. Although reservations had been embraced by reformers, they soon fell out of disfavor as a symbol of white control. They also seemed to fail just as much as the reservations in ameliorating the conditions of Native Americans which continued to worsen compared to an affluent postwar America. After World War II, the conditions on reservations were shown to be well below that of middle-class America. Poverty, unemployment, crime, and malnutrition were endemic on reservations. Rates for suicide, alcohol and drug abuse, depression, and infant mortality were startlingly high. Reformers sought a remedy by removing Natives from oppressive reservations and their historical stigma into mainstream America in what was called “Indian termination” policy. Whereas critics complained that Natives were forced into reservations, they now fought against being forced to assimilate. It seemed that both segregation and integration were abject failures and the elusive search for a successful policy respecting the liberty and equality of Natives would not be found. After World War II, the conditions on reservations were shown to be well below that of middle-class America. Poverty, unemployment, crime, and malnutrition were endemic on reservations. The 1960s and 1970s saw the rise of a movement in pursuit of Native American rights just as other groups engaged in similar reform movements. In several incidents occupying historic monuments, activists on the left sought to publicize the plight of Native Americans. In late 1969, hundreds of Natives and their white supporters occupied Alcatraz Island in San Francisco Bay to expose the historical discrimination and “genocide” suffered by Natives and to demand a center there for the study of Native American history and culture. The last occupiers did not leave Alcatraz until 1971. Politically radical Native Americans joined the American Indian Movement (AIM), and hundreds took over Wounded Knee in the Pine Ridge Indian Reservation in South Dakota in February, 1973. The members of AIM occupied the town for 71 days, and there were several exchanges of gunfire with federal law enforcement officials. For Native activists, it seemed more evidence of oppression by the federal government, but the charges were dropped against the leaders. The reservation suffered a crime rate nearly ten times that of Detroit after the federal officials departed, and the lofty aims of the activists were not achieved. The violent protest by radicals soon gave way to the multicultural and diversity trends in education during the 1980s and beyond. The term “American Indian” fell into disfavor as a symbol of European oppression and “Native Americans” became the accepted term. Activists called depictions of Native Americans as sports mascots racist and applied pressure to use more innocuous symbols. For example, Stanford University changed their mascot from Indians to Cardinals, and Dartmouth University from Indians to Big Green. Many historians began to portray the European settlement of America as an “invasion” or “genocide.” After Indian reservations gained the right to open gaming casinos, tribes began to earn large sums, and some non-Natives claimed Indian ancestry to take advantage of the windfall of revenue. Similar questions of who was a Native American were applicable to college applications and federal contracts, both of which employed affirmative action programs. Native Americans have rarely enjoyed the benefits of liberty and equality under the American republic. They have had a status throughout the centuries that has alternated between separation and assimilation. Federal policies related to Native Americans have changed many times over the last two hundred years, but none have seemed to improve their freedom or equality in American society. Unlike women or African Americans, who have won greater liberty and equality in recent decades to fulfill American ideals, Native Americans can point to few examples of progress. Over the past century, federal policies that have attempted both separation and integration have failed because they have been unable to resolve the tension of preserving the unique autonomy of Native Americans while at the same time integrating them into the American character. Marshall reversed his earlier decision and declared Native tribes as independent with guaranteed authority over all of their previously occupied lands. Marshall reversed his earlier decision and declared Native tribes as foreign nations immune to state laws. Marshall affirmed his earlier decision, declaring Native tribes as dependent nations bound by state laws. Marshall affirmed his earlier decision and expanded it to establish and set aside land parcels for each Native tribe. 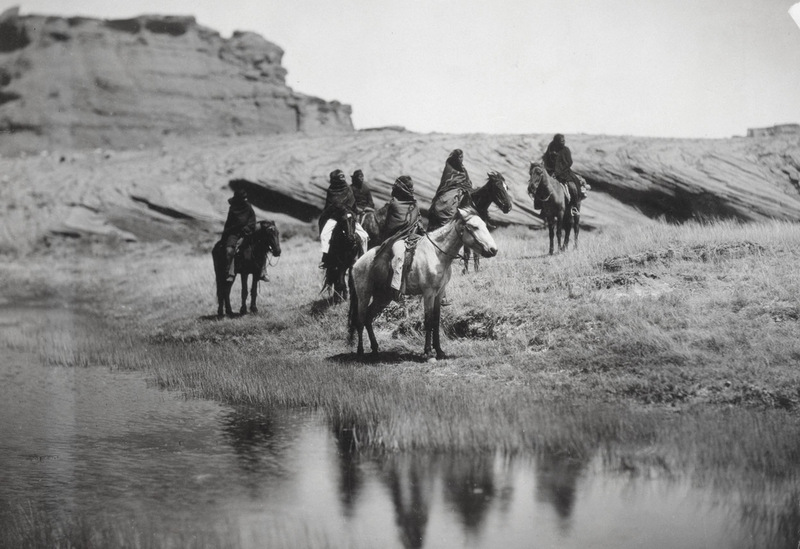 Protected Native tribes’ land by denying Western settlers the ability to acquire land. Denied any land to Native tribes while providing Western settlers unlimited access to land. Attempted to balance Western settlers’ demand for land with protecting lands for Natives by setting aside land parcels for Native tribes. Acquired additional territories for Native tribes by limiting Western settlers’ access to land.